Owen Taylor with broccoli rabe plants plump with seeds. Owen Taylor exudes love. 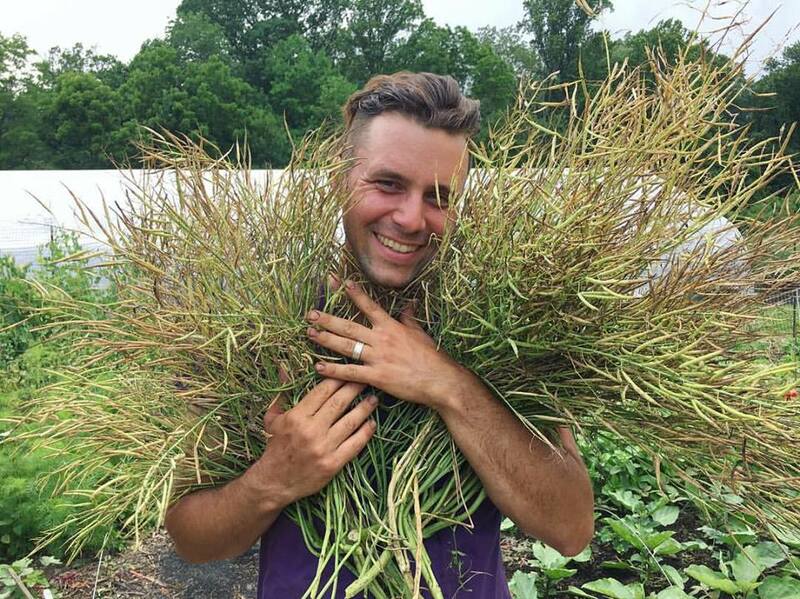 One look at him embracing a bunch of broccoli rabe plants like they are his children, or leading a workshop for farmers and activists, and you can see that the love he has for seeds and people runs deep. Owen is a long time community gardener, seed saver and food justice activist who's passion for seed keeping led him to found Truelove Seed Company in 2017. Their seeds, "are grown by more than 20 small-scale urban and rural farmers committed to community food sovereignty, cultural preservation, and sustainable agriculture. 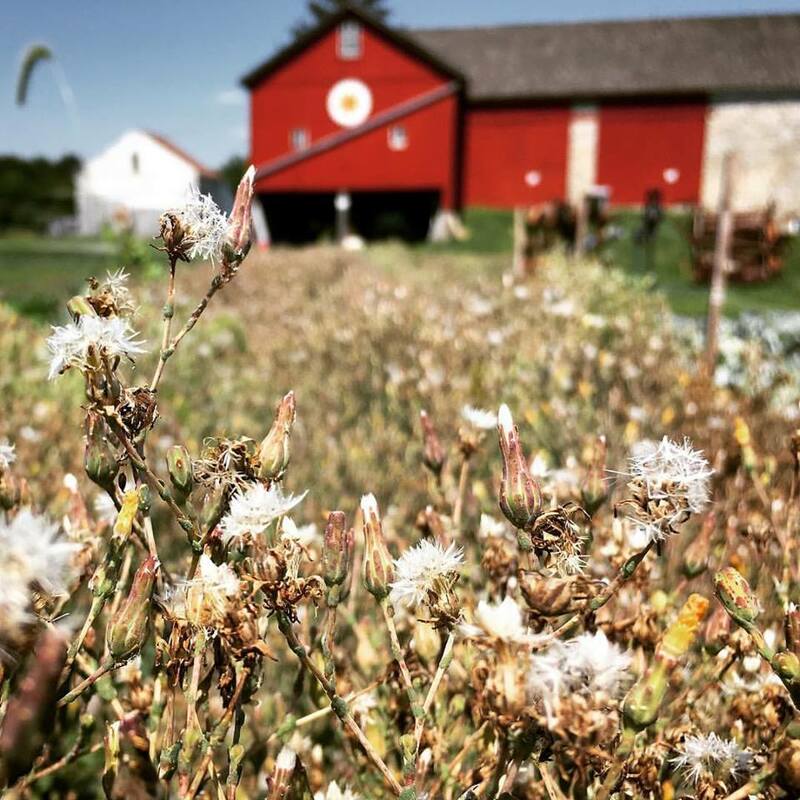 This collaboration is an opportunity for growers to share their own seeds and stories and to bring in extra financial support for their food sovereignty and agroecological projects." for our ANCESTORS and our collective FUTURE!" Digging into his own ancestry and that of the other farmers he works with has led the growers at Truelove to tend and keep many special seed varieties, as well as the amazing stories that go with them. These seeds and their stories reach back into many cultures including Italian, British, West African, and Syrian food ways, and are keeping alive and sometimes reviving crops that have important cultural significance, but go far beyond the basic seed selection you can find at most garden stores. You may often hear Owen say "The story is in the seed", and all you have to do is peek at the descriptions on the Truelove website to get a glimpse into this world and why the stories and rare variety seeds are so important. PIPPIN'S GOLDEN HONEY PEPPER for example, has a long legacy in the black catering community in the Baltimore/Philadelphia area in the early 20th century, "it is one of the many peppers traded by Philly area folk artist Horace Pippin for bee sting (treatments) from H Ralph Weaver's hives in West Chester in the early 1940s. 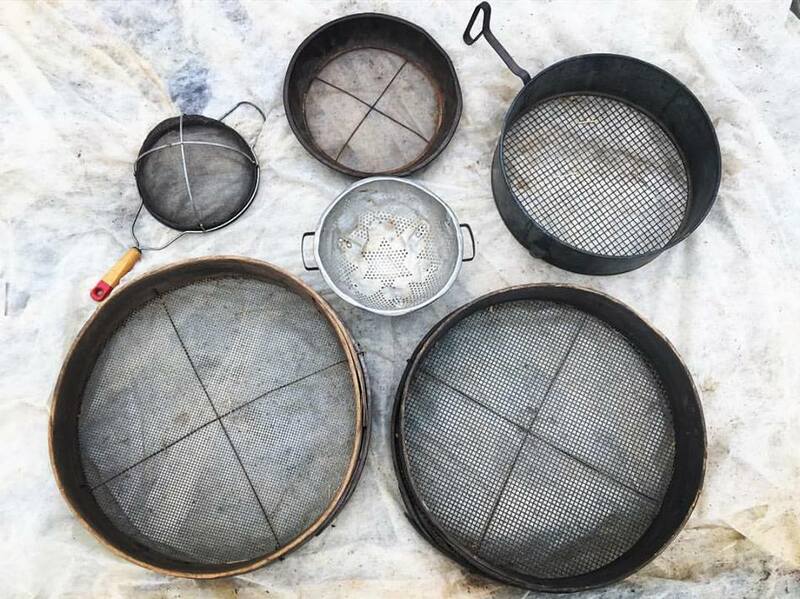 In a deep freezer, nearly half a century ago, William Woys Weaver found these seeds (as well as those of the Fish Pepper and many others) in labeled baby food jars." 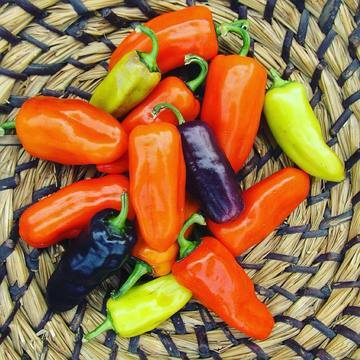 Pippin's Golden Honey Pepper, grown from seeds found in the freezer of African American folk artist Horace Pippin, more than 15 years after his passing. Another beautiful example is the Speckled Brown Butterbean featured in the logo for the company. They are held by Chris Bolden Newsome, Owen's partner and the farmer at The Sankofa Community Farm at Bartram’s Garden, and are one of the crops most important to him from his youth, growing up as a fourth generation free Black farmer in Mississippi. These butterbeans "have been grown and eaten in Mississippi since before God remembers. We received the seed stock earlier this year from Duck and Earl of Shaw, MS. Duck is the sister of Sankofa Farm friend and community elder Ms. Pearl Trotter." The Speckled Brown Butterbean, held by Owen's partner and farmer, Chris Bolden Newsome, at his African focused, Sankofa Farm at Bartram’s Garden in Southwest Philadelphia. This work goes so much deeper than just saving seeds to grow food. "Keeping SEEDS is an act of TRUELOVE for our ANCESTORS and our collective FUTURE!" The importance of learning the stories of people in different communities, and listening to elders are part of the meaningful community building and anti-oppression work that Owen, and many of the growers are carrying out. In addition to farming, and seed keeping, Owen works as a freelance facilitator, where he trains farmers, cooks, educators, and other community leaders in how to effectively share their knowledge and skills using popular education, dialogue, and a participatory, hands-on approach. Find out more on the workshops page. The use of popular education techniques (such as in the train the trainer program at Farm School NYC in the video below) gives the same respect to the people, that the Truelove growers give to the seeds; shifting the power and who is considered the "expert". In popular education, the wisdom is in the participants, and the process of learning is in collectively drawing that wisdom out of them, much the way the farmers are growing out the seeds and learning from them how best to help them thrive. 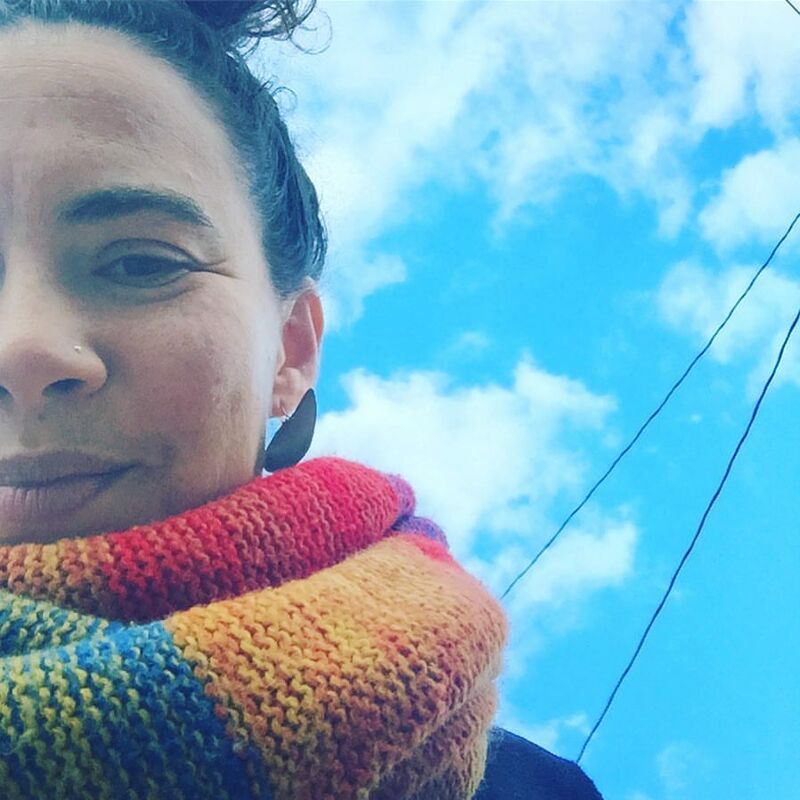 This wholistic thinking about how to repair our food system and our human relationships embodies the deep and joyful work we need to do to heal much of what is broken in our society. 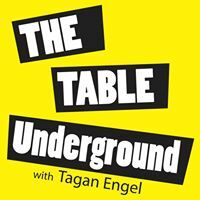 To hear Owen geek out on seeds, gush over seed stories and speak truth about vibrant community building and undoing racism in non-profits, listen in to our interview at the top of this post, or on most podcasting sites. You can find seeds and their stories at TRUELOVE SEED COMPANY, and tons more info about seed keeping and Owen's work on the SEED KEEPING tumblr site. For more seed inspiration, check out the Turelove seed collections: African Diaspora Collection, Ark of Taste Collection, Italian Collection, Roughwood Seed Collection, Syrian Collection. And, as if that isn't enough, Owen is also a musician, and half of the duo My Gay Banjo. For ongoing inspiration and gorgeous seed and community love follow Truelove Seed Co. at seedkeeping on twitter and instagram. From Owen's instagram: "My friends Mason and Wiley from Bear Bottom Farm in Dillwyn, Virginia grew White Velvet Okra from seeds we shared with them. They sent back this fresh seed with a note from Mason: 'They did great and tasted wonderful. I got a 3rd place ribbon for them at the Abermarle County Fair behind two entries of Clemson Spineless, the most generic okra. Wiley cleaned up in the oddball veggies category'."